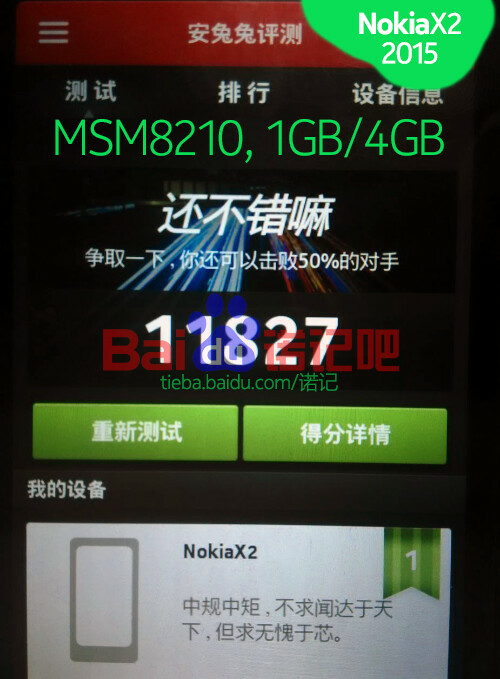 New Android-based Nokia X2 in the making? A new generation of Android-based Nokia X handsets may already be in the making. According to some details coming from China, a Nokia X2 was benchmarked recently, the test revealing that the device supposedly has 1GB of RAM, and 4GB of internal memory. Also mentioned is a Qualcomm MSM-8210 dual-core 1.2GHz Snapdragon 200 processor - the same that’s used by Motorola for its affordable Moto E. These features obviously make the new smartphone better than the current Nokia X, which has 512MB of RAM, and a 1GHz dual-core CPU. That’s pretty much all the info there is about the X2 at the moment. We have to note that, several years ago, Nokia released a series of cheap candybar phones called X2, X2-01, X2-02, and X2-05 - so we’re not really sure that the new Nokia X will also be called X2. But we’ll see. Nokia’s Devices and Services unit now belongs to Microsoft (as of last month), so it’s the Redmond company that will actually launch this alleged next-gen Nokia X. Of course, that’s assuming that the handset is indeed real. Just run all future Nokia phones on Android. Save the world a headache, and some cash. You can also do that... By not commenting on PA! Have you visited that site first before sending me the link? I think it'll be more useful to you. Pot on the kettle again. Nokia's brand and image is not know as an Android brand. Now its known as a WP and Microsoft brand. oh man... don't talk about Chinese products.. they kill themselves or they will kill u.. one of my friends "Chinese" phone blasted while playing game.. thank god he is good now..
there will be more better cheap phone than this X2 by 2015.. The problem is good old Microsoft is only thinking of profits only. They do not care about the normal Android experience which normally includes Google's vast ecosystem. Instead the Nokia X only gives you Microsoft apps and services only. Before you go on and say that you can root the device and sideload apps. The majority of the population don't do that. Also if you are going to take the time to root and sideload apps on a device. Then why would you even bother on a low specification device to begin with. If microsoft updates their forked Android OS to access and use Google play store apps like I think they will the Nokia/Microsoft X phones with the upgraded CPU and more Ram will sell like Hotcakes. MS CEO Nadella is no Dummy. He knows Microsoft can make a profit selling the X phones if they are made right. there are too many Android Customers for Microsoft to get to give up NOW! Microsoft would have to pay Google if they included Googles apps and services on their hardware. Do you honestly think Microsoft is going to pay Google? Personally I would love to see that happen. MS should scrap of this Nokia X project, and work on more lower end Lumias as WP is way better than the crap those run.